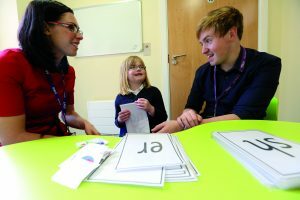 The Master of Education (MEd) Professional Practice in Dyslexia and Literacy is a programme designed to offer those who have studied with Dyslexia Action a route to gain a Masters qualification. The programme is quality assured by Middlesex University and you will receive a Middlesex University award upon completion. To join the programme, you should have already completed 120 credits at level 7 with Dyslexia Action. You will then be able to enrol on the 60 credit Enquiry-based SEND practice module with Real Training to complete your Masters level qualification. Contact us if you wish to transfer Masters-level (M-level) credits from another institution. The Real Training Enquiry-based SEND practice module starts in September, January and May. Book and enrol before 15 May to join our next cohort. Further develop your professional skills and knowledge through work-based project implementation that will enable you to support other practitioners in educational settings. Research and critically analyse aspects of Dyslexia and Literacy in greater depth. Develop your professional practice using the findings of published research and via critical analysis of the evidence base for Dyslexia and Literacy interventions. Further develop your skills as a professional practitioner researcher. Develop different models of partnership with an understanding of the place of power and ethics in educational settings and in listening to and understanding adults and children, parents and carers. Work closely with your peers and be mentored by experienced tutors online. Enjoy dedicated specialist support from our experienced tutors. Receive dedicated support from our tutor team – comprising experienced specialist teachers and educational psychologists. Learning Phase 1 – what’s included? For more information about these modules, to check costs, start dates and to book please visit the Dyslexia Action website. Once you have completed these modules and gained your 120 credits, you are ready to move on to phase 2 of your learning journey. Learning Phase 2 – what’s included? To start phase 2, you will need to have completed 120 credits at level 7 with Dyslexia Action. Once the qualifying modules are completed, you simply need to complete the Enquiry-based SEND practice module with Real Training to gain your Master of Education Professional Practice in Dyslexia and Literacy. Please see the dedicated page for this module to find out more about the course content and learning outcomes. Do you already have credits from Dyslexia Action courses? To access the Master of Education Professional Practice in Dyslexia and Literacy programme, you will need to have completed 120 credits from the level 7 Dyslexia and Literacy modules offered by Dyslexia Action. Please see the list of modules in the ‘Learning Phase 1 – what’s included?’ section for details. If you have not yet completed modules with Dyslexia Action but are interested in achieving the Master in Education Professional Practice in Dyslexia and Literacy, please contact us on 01273 358080 to discuss the best route for you. You will need one to complete this programme. This course is available online and can, therefore, be completed anywhere in the world. Please click here for advice on payment options and other information relevant to those studying outside of the UK. Single payment of £1,950 + VAT. Three monthly instalments of £675 + VAT. Ten monthly instalments of £207 + VAT. Speak to us (01273 358080) for more information or make a booking. Real Training modules start in September, January or May.